Where to find Hilton Head hotels near an airport? Where can I find hotels in Hilton Head that are near tourist attractions? There are numerous possibilities for travelers looking for a place to stay in Hilton Head. You will find 50 hotel options within 0.1 kilometres (0.1 miles) of downtown Hilton Head on our comprehensive accommodation section. 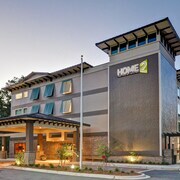 Looking for a hotel within strolling distance of the heart of Hilton Head? 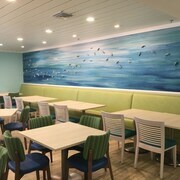 The Bluewater Resort & Marina by Spinnaker Resorts and Ramada Hilton Head is sure to satisfy. The Montage Palmetto Bluff is positioned 13 kilometres (8 miles) from the center of Hilton Head. Or, alternatively, the Marriott's Harbour Club is located 10 kilometres (6 miles) away. Two other options worth looking into are the Disney's Hilton Head Island Resort and the Marriott's Grande Ocean. If you are keen to see more of the beaches and coastal plains common in this region, you could also book some time in other parts of Coastal South Carolina. You could travel to local various sights or enjoy cycling, shore fishing and swimming, and afterwards book a suitable hotel. Bluffton is 10 kilometres (6 miles) to the west of Hilton Head, and is home to the Tanger Outlet Center and the Colleton River Plantation Golf Club. Expedia-listed Bluffton hotels are the Comfort Suites Hilton Head Island Area and Holiday Inn Express Bluffton at Hilton Head Area. Or, you could stay in Port Royal, 20 kilometres (12 miles) to the north of Hilton Head, where you can pick from the Super 8 Port Royal/Beaufort and Days Inn Port Royal/near Parris Island. If you're staying in Port Royal, don't miss Port Royal Skateboard Park and Lowcountry Estuarium. Charleston is positioned 100 kilometres (62 miles) away from Hilton Head. While you are there, you may wish to explore the USS Yorktown, the Citadel and the Medical University of South Carolina. The South Carolina Aquarium and the Charleston Museum are also well worth your time. The Isle of Palms and Wild Dunes by Wyndham Vacation Rentals and Wentworth Mansion are all great the places to stay in Charleston. 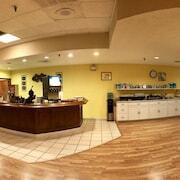 Hilton Head Airport is a nearby airport for Hilton Head travelers, and is 5 kilometres (3 miles) from Hilton Head. 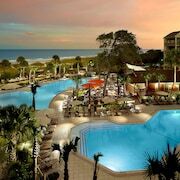 Conveniently located hotels include The Westin Hilton Head Island Resort & Spa and Marriott's Barony Beach Club. What are the most popular Hilton Head hotels? 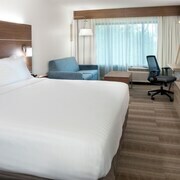 Are there hotels in other cities near Hilton Head? What other types of accommodations are available in Hilton Head? Explore Hilton Head with Expedia.ca’s Travel Guides to find the best flights, cars, holiday packages and more!